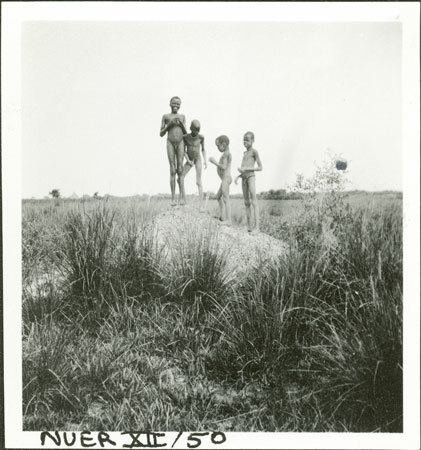 A group of four young boys standing on what looks like a termite mound, with tufted grasses growing around it. The film number suggests that they are boys from Yakwach cattle camp on the Sobat River which Evans-Pritchard revisited in 1935. The roof of a cattle byre (luak) can just be made out to the left side. Note on print reverse ms pencil - "43 5 A57" & print front border ms ink - "NUER XII/50"
Morton, Chris. "Nuer boys" Southern Sudan Project (in development). 03 Jan. 2006. Pitt Rivers Museum. <http://southernsudan.prm.ox.ac.uk/details/1998.355.571.2/>.